A MAN who hid in a children's cubby house after smashing his way into his ex-partners' place has received parole. The Kingaroy man was sentenced to parole for four months when he appeared before Kingaroy Magistrates Court on Monday September 3. Magistrate Louisa Pink said it was not the first time the man had committed this offence, having smashed his ex's window just weeks earlier. "Both times he smashed the window, she had to go to the neighbour for help, and he's actually dragged her back into the house," she said. The 27-year-old man was charged with a total of six charges, including wilful damage for breaking windows, trespassing, breaching a domestic violence order and obstructing police officers. He breached the domestic violence order on Sunday September 2 when he approached his ex-partner's place. She had run to the neighbours for help, who called the police, after the man had smashed the window to gain entry. Prosecutor Barry Stevens said when police arrived the ex-partner was visibly upset, and the man had run out the door when police tried to enter the premises. The 27-year-old man had trespassed, by jumping into the neighbour's yard and hiding in a children's cubby house. The court heard police had to use force to open the door of the cubby house. The court heard he had been extremely intoxicated after drinking at the Kingaroy Commercial Hotel earlier that day, where he had been approached by his ex-partner. The court heard he had initially refused her pleas to see his child, which would break the domestic violence order. 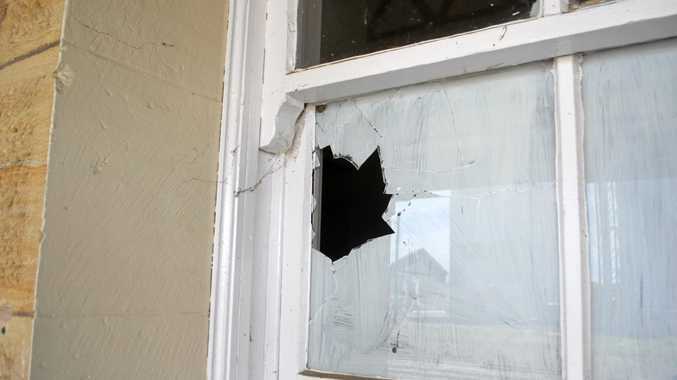 The Kingaroy man had previously approached his ex-partner's residence on Saturday August 11, and smashed the glass window to gain entry into the building after she refused to let him in. He located his ex-partner and child, before she ran out to get help from the neighbour. The court heard he had dragged her back into the house, within the presence of their child. When police officers arrived, he attempted to push the constable's hands away, and was yelling at the officer, resulting in an obstructing police officer charge. At the time of the offences, the man was on a suspended sentence for a different offence, and had only recently been released. "I think your conduct and your history combined is concerning," Magistrate Pink said. The man was ordered to pay $218 to the Maryborough Department of Housing for the window damage. Magistrate Pink said she considered the very early plea, but designed the sentencing to reinforce his understanding of the legal system. "You were already on a suspended sentence and it did not stop you," she said. He was sentenced to three months imprisonment for the two wilful damage charges and one month imprisonment for the domestic violence breach. His was released on immediate parole. The Kingaroy man will appear at Kingaroy District Court at a later date for committing the offences whilst on a suspended sentence set by a Brisbane court.